Guest speaker Peter Smith was born and brought up in and around lighthouses. He is the descendant of a long line of lighthouse keepers and has many stories to tell. Peter talks about growing up living in lighthouses fifty years ago, using stories about things that happened to him, his family and other lighthouse keepers. He discusses how his family coped with the problems and benefits of living next to the sea, in isolated places before electricity, televisions, cars, computers and mobile phones. All lighthouses are now automatic so he was lucky enough to have had, what is now, a unique child hood. 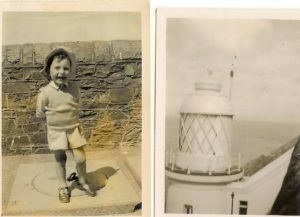 Check out this picture of Peter – taken a little while ago – standing on the water tank at Lynmouth Foreland lighthouse.